Went a little 356-crazy this weekend... I recently got these three from R32rennsport so they were still sitting on my work bench, and I just couldn’t help myself. Into the stripper they went, and here is the result. 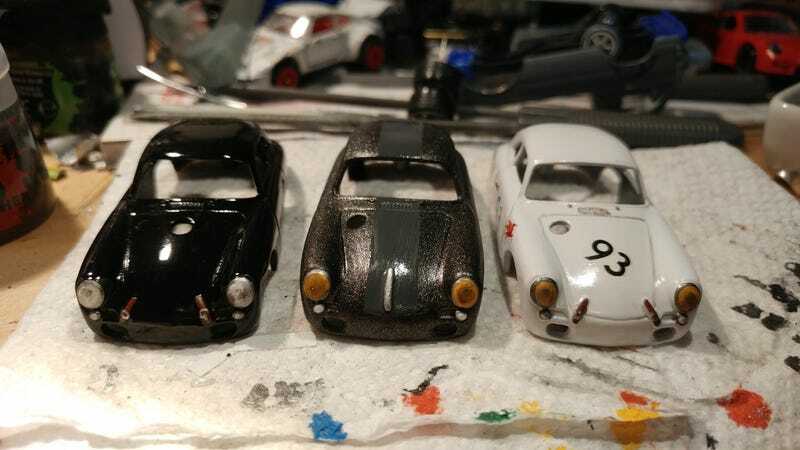 Three greyscale 356 Outlaws, each with a little extra touch. On the black one I moved the fuel filler to the center of the hood. I drilled a whole for the new one, then filled in the old hole with superglue, which is fast turning into one of my favorite fillers for small-ish cracks and gaps! The look is inspired by a shiny black example I saw on the interwebz not long ago, and I might still add a square old-style Dutch license plate to it. On the grey one I got rid of the hood straps and added a little decoration there. It turned out a little bit wider than I intended but still looks nice. The paint work here was inspired by a photo Enginerrrrrrrrrrrrrrr posted on instagram of a 356 with a shadow stripe. In this case the grey was a little lighter than intended, but hopefully a glossy clearcoat will help everything blend a little better. On the white one I sanded off all the rain gutters for a smoother roof, and got rid of the louvers on the engine cover in the back. Just a little clean look. For this one I wanted a clean vintage racing feel. Now I need to give them some funky interiors, some wheels, some window trim, and they’re good to go back out on the road.